Want to add a tablet to your LG shopping list this August? 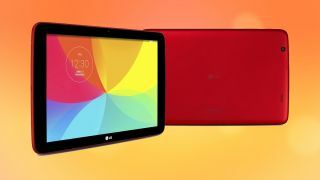 It looks like August will be all about LG, with the announcement that the LG G Pad 10.1 will be going on sale in Australia at about the same time as the LG G3 and G Watch. While an August 4 sale date has been given for the LG G3, and the G Watch, the G Pad 10.1 doesn't have an exact arrival date beyond "early August". The 10.1-inch slate was announced a month ago alongside 8- and 7-inch models, though no local launch details for the smaller tablets have been revealed yet. The LG G Pad 10.1 is powered by a 1.2GHz quad-core processor, 1GB of RAM and 1280 x 800 True IPS HD displays. You also get a 5MP rear camera, 1.3MP front snapper, Android 4.4.2 KitKat and an 8000mAh battery, along with a microSD slot. Available in stores in the first few weeks of August, the tablet will be on sale for $399 from Harvey Norman, The Good Guys, Bing Lee, and Betta Electrical. LG will also have a G Pad Quick Cover available for $69.